Firefighters monitor a backfire while battling the larger Carr Fire on July 27, 2018 in Redding, California. A hotshot firefighter killed while fighting the Ferguson Fire is one of six firefighters killed while fighting or training to fight fires in California this year. Captain Brian Hughes, of the Arrowhead Interagency Hotshots, died Monday. Hughes 33, and his crew were operating in a complex area when he was struck by a tree, according to Cal Fire officials. He was treated on scene, but passed away before he could be transported to a hospital. The unit is out of Sequoia and Kings Canyon National Parks. 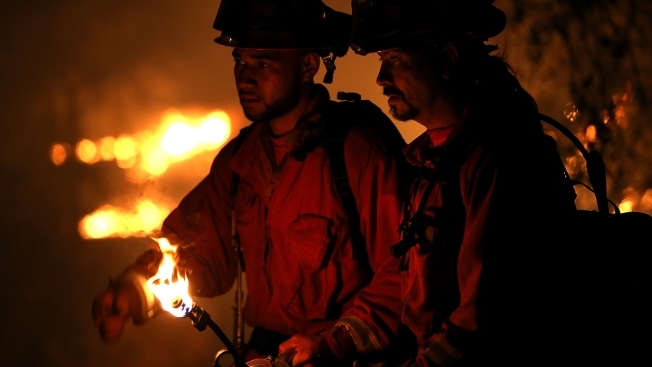 Hughes' death is the sixth firefighter fatality reported this year in California. In comparison, of the 67 firefighter fatalities recorded in 2016 according to the most recent FEMA report, four occurred in California. July was the deadliest month in the 2016 report and it has proven to be so this year. Braden Varney, a firefighter/equipment operator with Cal Fire Sacramento, died July 14 while fighting the Ferguson Fire. His bulldozer overturned and rolled down a ridge. Varney’s body was removed two days later. The cause of death is under investigation. Over two days last week, two men fighting the Carr Fire burning near Redding were killed. Don Ray Smith, 81, of Pollock Pines, was working as a bulldozer operator and helping clear vegetation in the path of the wildfire. Smith was overtaken by the fire on July 27, according to the Shasta County Deputy Coroner. His body was located by fire crews. Redding Fire Inspector Jeremy Stoke was killed on July 28, the first firefighter working for the city of Redding to be killed in the line of duty since 2004. Stoke was battling the Carr Fire when he was killed, according to the International Association of Fire Fighters Local 1934. No details have been released concerning what caused Stoke’s death. On June 25, Long Beach Fire Captain David Rosa with the Long Beach Fire Department was shot while responding to a fire at a senior living facility. Rosa was rushed to a nearby hospital but died from his injuries. Anthony Colacino, an inmate firefighter trainee with the Sierra Conservation Center – California Department of Corrections & Rehabilitation in Jamestown, collapsed on a training hike on April 21. The cause of death is under investigation. 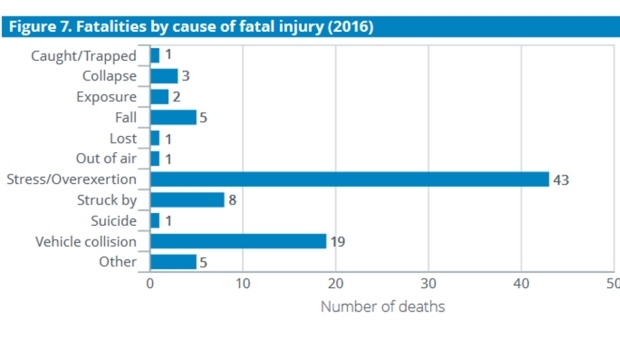 The FEMA report, the most recent one available, indicates that stress or overexertion and vehicle collisions are the leading causes of death for firefighters. As of Monday, July 30, the Ferguson Fire had burned 56,659 acres with 30 percent containment and 3,766 personnel fighting the fire. The Carr Fire had burned 95,368 acres and was 17 percent contained. There were 3,388 personnel fighting the fire.